Porsche’s development boss has insisted the Detroit show-stopping 918 RSR hybrid race car will be developed alongside the open-topped Spyder road project, instead of replacing the 2010 Geneva concept. The 756bhp RSR mixes the hybrid systems from Porsche’s 911 GT3 R hybrid project, the engine from the RS Spyder race car and the bodywork of the 918 Spyder, modified for vertically opening doors and a roof. The RSR’s launch at Detroit — marking Porsche’s return to the show after a four-year gap — prompted speculation that the 918 project as a whole had evolved into a hard-top. But Porsche’s outgoing board member for development, Wolfgang Dürheimer, insisted that the hard-top development would be focused on motorsport. “The road application of this car is the 918 Spyder, There is no decision taken that the coupé type will be available on the Spyder. We learned from the Carrera GT that the driving pleasure of the car is enhanced when you have the possibility to drive open or closed. 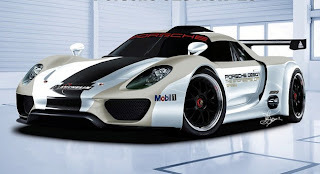 Porsche is said to be in talks with race series organisers about making the car eligible, although sources suggest it could struggle to gain entry to a major event in 2011. Dürheimer also said the firm is preparing to offer petrol-based hybrids across its entire range in future.